Miltoniopsis blooms are large, flat, and round with broad lips. Blooms are seen in an array of bright colors such as yellow, pink, red, purple and white. Miltoniopsis produce oval-shaped pseudobulbs and each pseudobulb produces a single leaf from its top. Foliage and pseudobulbs are almost gray or blue-green in color. Pseudobulbs may grow one or two spikes, either simultaneously or in succession. So when a Miltoniopsis plant blooms you should have quite the display that can last for several weeks. Miltoniopsis orchids have fine roots that shouldn’t be dried out completely. For the most part, in warmer months you will want to water at least once a week. Watering frequency – as covered in this article about watering orchids – can be determined by a few different things. A sign that you are under-watering is if you see accordion-like pleating of the foliage. However, you will also want to make sure that you do not over-water because this can cause the fine roots to rot. Finding the right watering schedule for your Miltoniopsis can be tricky, but once you learn how your plant adapts to its environment, you will be able to come up with a watering schedule that works for both you and you orchid. As covered in this article about orchids care and light, Miltoniopsis orchids require low light intensity. If your orchid is receiving too much light the foliage will turn yellow or a pinkish-red color or become spotty. If you orchid is receiving too little light the foliage will turn a dark green color. If you are growing your Miltoniopsis indoors, an ideal place would be near a shaded southern facing window. As discussed in this orchid plant care article on temperature, Miltoniopsis’ are cool to intermediate temperature orchids. The temperature requirements for Miltoniopsis are daytime temperatures somewhere between 70°F to 80°F (21.1°C to 26.7°C) and night temperatures between 55°F to 60°F (12.8°C to 15.6°C). If your plant experiences temperatures higher than the recommended temperatures above, it will not harm the plant, although you do not want to subject the plant to high temperatures for excess periods of time. As covered in this “humidity” article on how to care for orchids, Miltoniopsis thrive in humid conditions. A relative humidity level that is ideal for Miltoniopsis is somewhere in the 50-70% range. If you need to increase the humidity for your orchid, you can add a humidity tray or humidifier and also misting your orchid a few times a day will also increase the humidity. It is also important to remember that the more humid you keep the orchids environment, the more air movement your orchid will need to help prevent any disease. Fertilize you Miltoniopsis orchid at every other watering using a diluted (half-strength) fertilizer solution. If your orchid is planted in bark you will want to use a high-nitrogen solution (30-10-10), or a balanced solution (20-20-20) if planted in other media. In order to help with flowering you can use a low-nitrogen, high-phosphate fertilizer (such as 10-30-20) every fourth or fifth feeding. You should always water your orchid very thoroughly once a month so that the excess fertilizer build-up can be removed. Miltoniopsis are especially sensitive to buildup, and leaf tips will blacken as a result. To keep your Miltoniopsis orchid as healthy as possible, you should repot it in fresh medium each year after the blooming cycle. 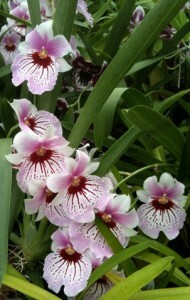 Miltoniopsis orchids can be potted in a fine-grade fir bark mixed with charcoal and perlite for good drainage. Miltoniopsis orchids tend to do very well in plastic pots since they can retain moisture for longer than clay pots, just be sure that there are enough holes in the bottom for adequate drainage. You can divide your Miltoniopsis, although you need to keep at least four to five pseudobulbs per division. #1 – More Free Miltoniopsis Tips! If you’d like to learn everything you need to know about Miltoniopsis orchid care (and caring for ALL types of orchids) we also have something called the Orchids Made Easy Green Thumb Club.